Are you ready for Thanksgiving? 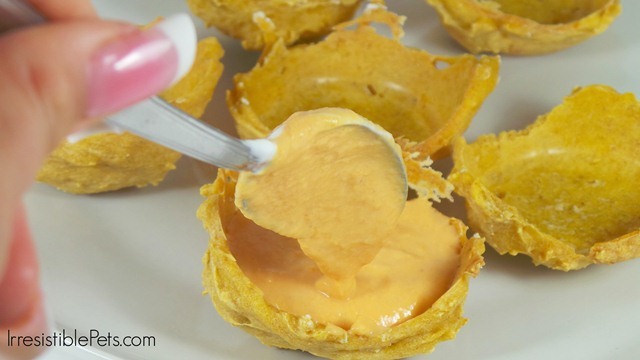 I’m spending my evening catching up on some blog work and making a few pumpkin cheesecakes for the festivities with our family and friends. 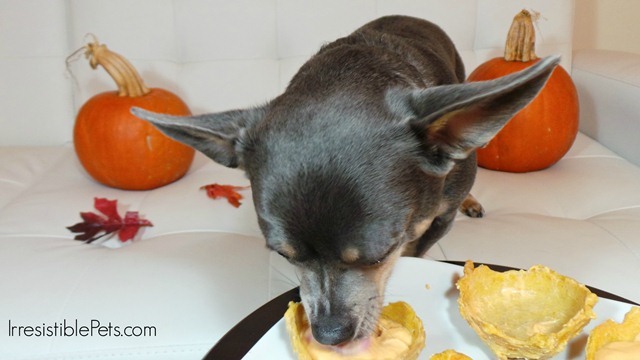 This includes an extremely easy no bake pumpkin cheesecake for dogs! 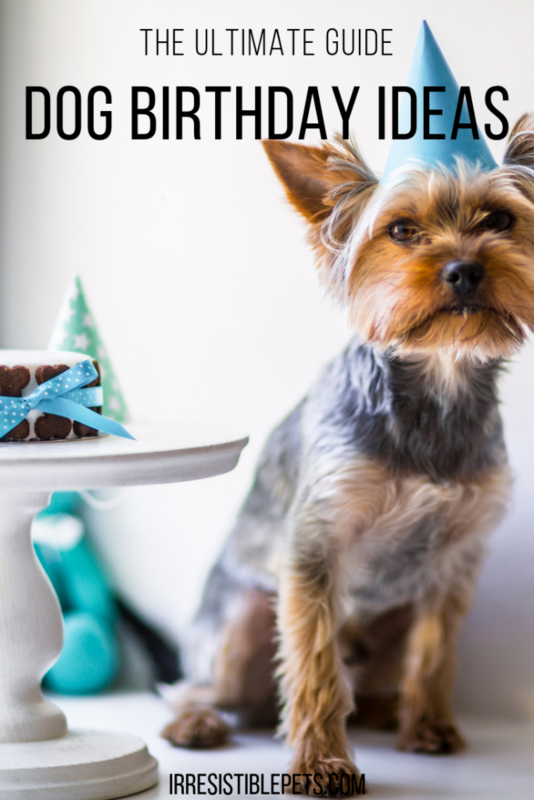 You know I always have to include a dog treat recipe for any holiday! Trust me when I say this is EASY! Ready to learn how? Ok, let’s get started! 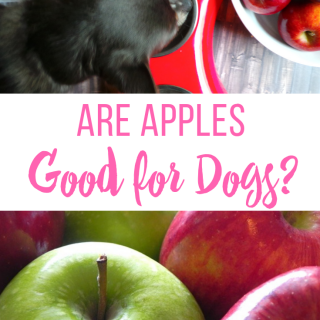 These are 100% dog friendly including the “pie crust” and filling! Start by making the pie crusts first and pre-heat the oven to 350 degrees Fahrenheit. 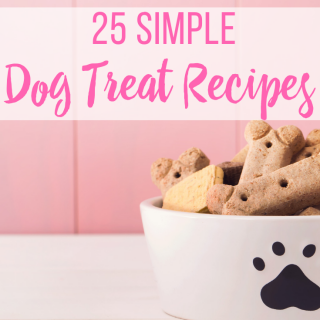 This is the same recipe I’ve used many times for my simple two ingredient dog treats. 1. 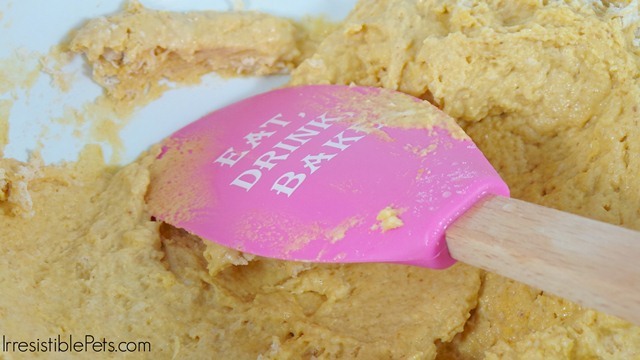 Combine two jars of baby food with the flour until it forms a stiff dough. You may need to add additional flour or water as needed. I mix sodium free beef broth into my water to give it extra flavor. 3. 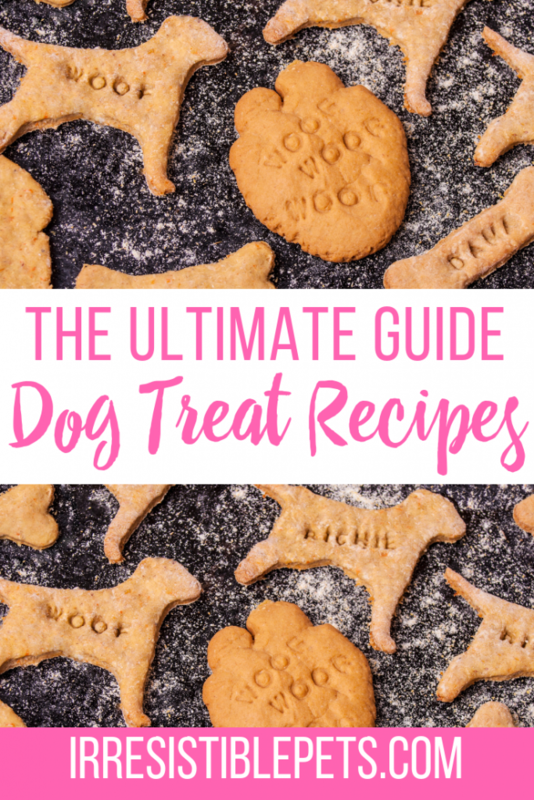 In all of my experiences with this dog treat recipe, the dough is usually a little bit sticky and doesn’t roll out too well. That said, use a spoon and mold the dough over the bottom of the muffin pan. Here’s a visual to help you out! 5. While the pie crusts are cooling off, you can work on baking the cheesecake filling. 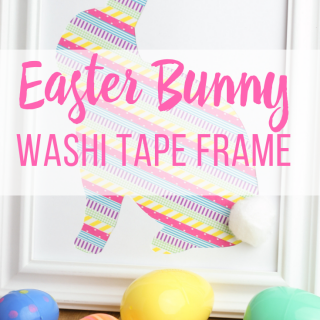 This part is super easy! 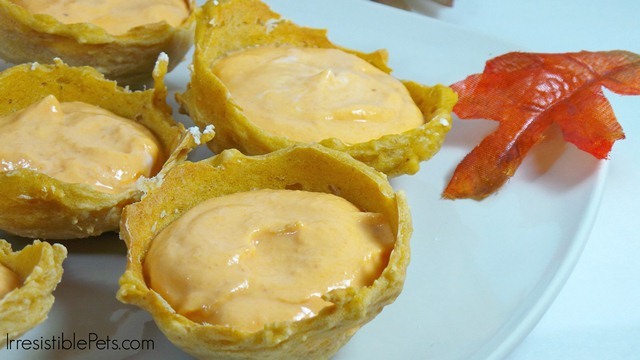 Combine the pumpkin and yogurt in a bowl. That’s it! 7. Chill in the fridge for a few hours before feeding them to your dog. 8. 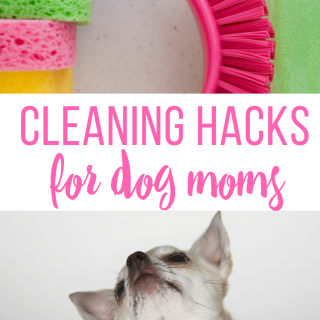 Remove from the fridge, serve to your dog and watch them go insane! 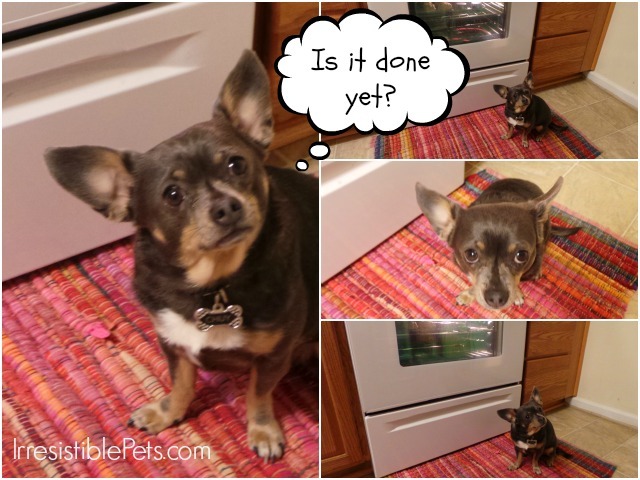 Chuy loved this recipe so much that he never left my side in the kitchen the entire time I was baking. Then again, that’s nothing new with Chuy! He comes running anytime he hears me opening a bag, turning on the sink, getting ice, opening my chapstick . . . yes, he is obsessed with chapstick and one time he even stole a chapstick out of my Mom’s purse and we didn’t even know it until the next day! 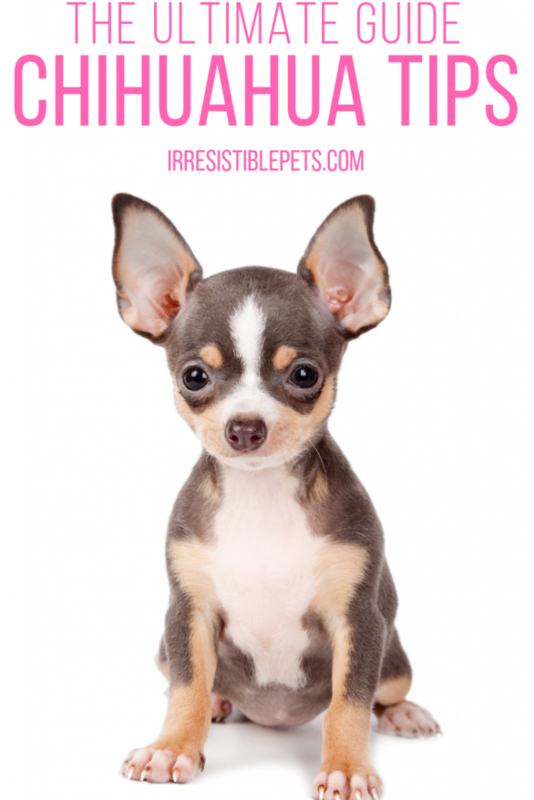 You gotta watch out for this sly little Chihuahua! 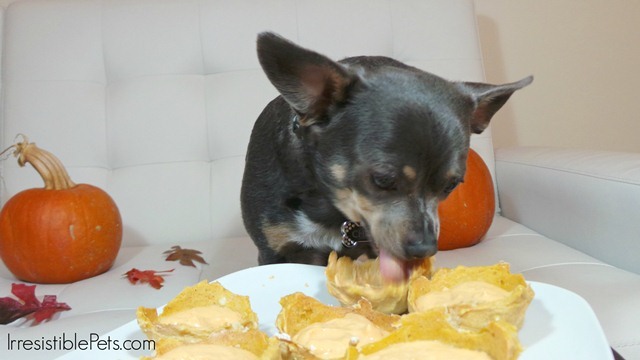 It was nearly impossible to get a good pic of him with the pumpkin cheesecake because he found it totally irresistible! It was seriously a comedy show behind the scenes when my husband and I were trying to get some decent pics of him. I couldn’t get a “posed” shot for the life of me . 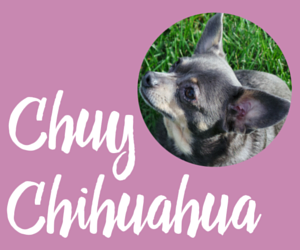 . . so here’s Chuy in action! LOL! I hope your dog enjoys them just as much as Chuy does. Happy Holidays! 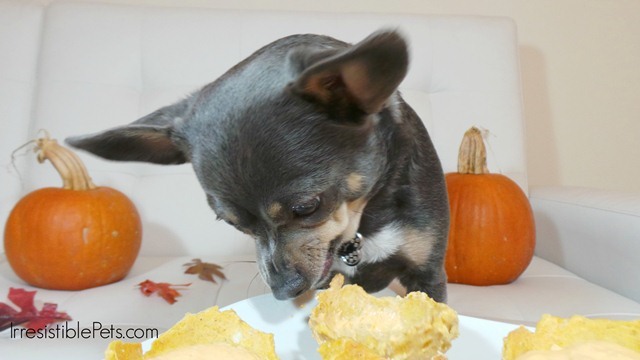 No bake pumpkin cheesecake dog treat recipe. Perfect for Thanksgiving or the Holidays! Combine the baby food with the flour until it forms a stiff dough. You may need to add additional flour or water as needed. I mix sodium free beef broth into my water to give it extra flavor. 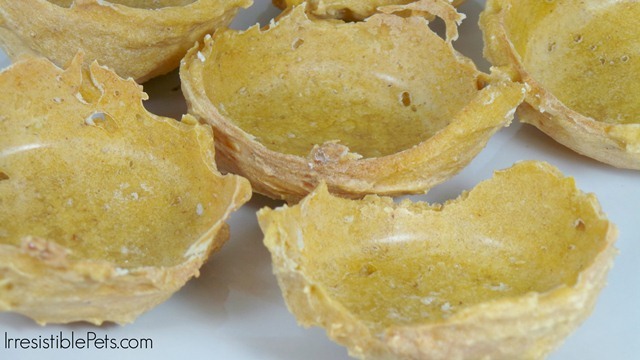 Lightly spray the bottom of a muffin pan with Pam. 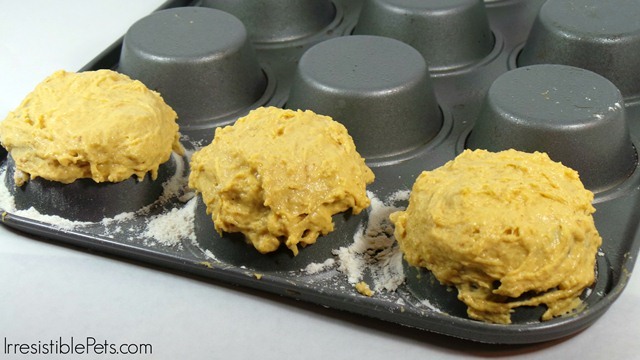 Use a spoon to drape the dough over bottom of the muffin pan. Bake for 20 minutes and allow the pie crusts to cool. 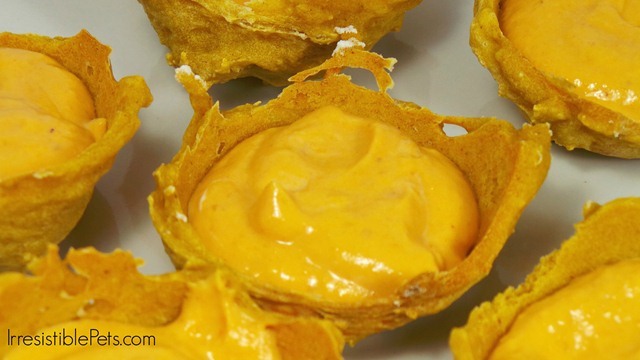 Combine the pumpkin and yogurt in a bowl. 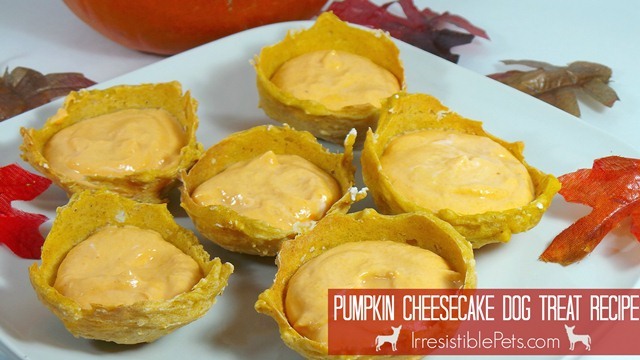 Chill the pumpkin cheesecakes by placing in the fridge for an hour or two. What type of baby food did you use for yours :O? I used an organic brand I found at Harris Teeter.